U.S. News and World Report will be bringing you the latest from the Conservation Political Action Conference, where several U.S. Senators and House members are expected to speak. The annual Conservative Political Action Conference, which attracts thousands of grass-roots conservatives to Washington, D.C., gets under way Thursday and political eyes are watching the event to be a harbinger of what's to come for the still bruised Republican Party. However, the tension that's plagued the Republican Party following the 2012 electoral defeats is spilling over to CPAC this year and some conservatives wonder what role the conference still plays. Wednesday, Elizabeth Flock uncovered that the ruckus that has been started over the exclusion of Republican gay rights group GOProud from CPAC, for the second year in a row, may be about to get a little bit bigger Thursday. There's a whole lot of fun. here at CPAC - the music has a younger edge to it, with Mumford and Sons and fun. playing between speakers. Discussing war spending, Dr. Ivan Eland, Senior Fellow at The Independent Institute notes government spending as a percent of GDP actually grew under conservative hero Ronald Reagan thanks to the Cold War. He suggests following Calvin Coolidge's model, who Eland says cut government spending in half. You know we are with a well-informed conservative crowd, because typically calling out Ronald Reagan is frowned upon among GOP-ers. But as Eland pointed out, he was quite the wartime spender. Jenny Korn of the American Action Network points out that different states have different needs when it comes to immigration reform, even among border states. Korn's tone reflects a change in conservative attitude about coping with 11 million undocumented immigrants. "I don't like amnesty, but this is a real problem we have to deal with it," she says. She adds that "harsh rhetoric" from certain pols has poisoned the well in the past. The convention hall is still largely empty and the crowd hasn't reacted much at all to immigration discussion. "Republican elected officials who vote for tax increases are rat heads in a Coke bottle," Norquist says, discussing the kind of brand damage that can be inflicted. 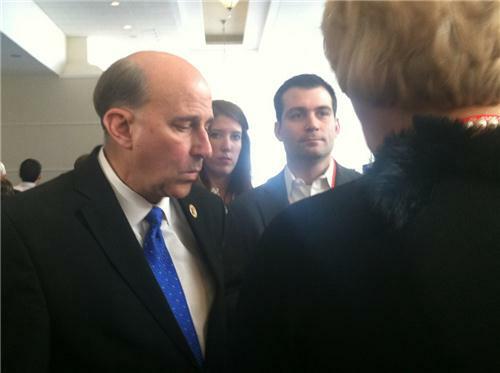 Rep. Louis Gohmert, R-Texas, says the Tea Party is far from dead "unless all these people at CPAC are zombies." A panel on a federal balanced budget amendment is being moderated by anti-tax crusader Grover Norquist. Also on the panel: Derek Khanna, the former Republican Study Committee staffer who was fired for publishing a paper on copyright reform not approved by his bosses. Khanna has also been leading the popular campaign to make unlocking cell phones legal. Leading into prime time here at CPAC - up next, Sens. Marco Rubio and Rand Paul. Former Alabama congressman Artur Davis, who famously switched from the Democratic to the Republican party, is speaking on a panel about inclusion in the conservative party. Davis said the GOP needed to work on "how to get people who on first blush don't think like us." That's it for today's coverage. Come back tomorrow when will do it all over again!